Applause is generally done as a sign of appreciation and approval. Have you ever sat back and watched a group of people applaud? What did you notice? Imagine for a second that you are an alien with no prior social conditioning or understanding of our habits. 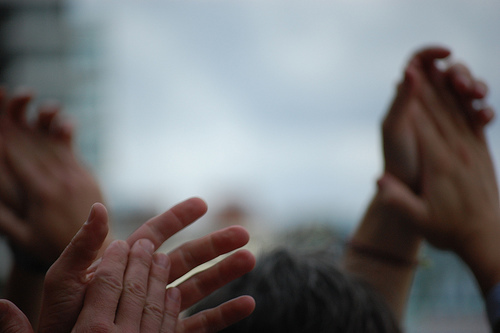 I wonder what you would think, if all of a sudden a group of people started making lots of noise with their hands…Have you thought about why we clap with our hands? Surely stomping your feet would also make the same amount of noise. A recent article in Esquire offers a short article on the history of clapping if you are interested as this is not an anthropological study on the tradition of applause. The point is what do people applaud? I must say, I don’t understand why some people clap when a plane lands. Are they that surprised that the pilot actually managed to land the plane?! Surely if the odds are that low they wouldn’t get on the plane in the first place. Then there’s the applause at the end of a film at the cinema. The actors, producers and directors can’t hear you so who or what are people clapping at? If clapping is indeed a form of admiration, when was the last time you clapped at something other than a performance? If one applauds to show appreciation why not applaud a sunset or sunrise? Or a good meal? Or anything else we may take pleasure in? We are in January and still full of good intentions for how the rest of the year will go. Resolutions may be short lived, so let’s call it resolve and determination. Whatever euphemism we chose to use, the main thing is it’s all about making choices. What will you chose to applaud? What do you want to accomplish? How will you stick to it? Will you boo at yourself for failing? How will you reward yourself for your achievements? You are the main protagonist in your life so surely you deserve a standing ovation. I say we make 2010 the best performance ever. Let the show begin! Someone once told me that applauding by clapping in a group started in theaters – that it was a physical gesture to say "thank you" to the actors and production. It was the easiest way to make a noise while seated as a form of cheer at the end of the event. Personally, I clap when I laugh..! I suppose it´s a thank you to whoever made me do it! Thank you for your comments Sara. It makes sense that applauding by clapping started in theatres. Thanks for sharing that. I love the fact that you clap when you laugh! I am sure that whoever has made you laugh really appreciates it. I find that laughing is contagious, have you noticed if your clapping is too? Heya, absolutlty adore the blog and definately will be returning within the near future! Thank you. I am really pleased you enjoy the blog. If there is anything you would like to read about on here just let me know. I look forward to your future comments. Happy reading! Thanks for your comments. I’m glad you liked the blog and found it beneficial. Good luck with your poker! I totally agree with you. We don’t know if something will work for us until we try it. Have you discovered anything new? This is my first time to visit your site and I must say that you write and do your research very well. Very informational and up to date. Keep up the good work. Will be following your next update. I also like the layout of your site.. Looks professional.. I like the idea of looking at your categories and blogging the most about that – it’s good inspiration. I have been torn between the direction of what my newest site should be focused on and after reading this and a little steve palina yesterday, i think personal is how i want to go next. You’ve done it once again! Superb article! Really nice blog you made there. Some of your posts really impressed me. I will definitely visit your blog again!